Every Resident Evil game is only as good as its setting, and the Raccoon City Police Station is one of the best. The centerpiece of Resident Evil 2, the Police Station is an austere, neo-Victorian government building. It’s also, improbably, a labyrinth—one that belies its appearance as a sanctuary from a city full of zombies and turns out to be as full of zombies and danger as anywhere else in the infested town. Half the doors are locked with arcane traps; the others are just locked. A secret passageway leads to the parking garage, if you can solve the puzzle hiding it. It might be the only way out. Resident Evil 2‘s remake, out this week for PlayStation 4, Xbox One, and PC, is dedicated to the feeling of that place, and to capturing the tension players felt upon entering it in the original 1998 game. In it, as in the original, you play as either Leon Kennedy, a rookie cop, or Claire Redfield, an adventurous woman looking for her policeman brother. Both flee to the police station after realizing the town is overrun with the undead, and both realize their mistake quickly. The rest of the game is consumed with one overriding concern: escape. Resident Evil 2 is not a remaster, as such. I’ve been calling it a remake for a reason: taking the basic structure and narrative of the original game and wedding it to an entirely new game engine, with new design principles and gameplay structures. It’s a reinterpretation of the same story, but an entirely new game, albeit one adhering to the same general aesthetic interests. Those interests, more specifically, are tension and scarcity. The original Resident Evil games are called survival horror, but they’re more like exploration-based thrillers. Not scary, exactly, with the exception of some intense gore and a few goofy jump scares. Instead, the fear comes from scarcity of resources and the constant need to move forward to gather more resources, solve puzzles, and hopefully find safe harbor from which to plan your next steps. To put it another way, Resident Evil 2 is a zombie-fighting game that refuses to give you enough bullets. Even on the most generous difficulty settings, multiple shots are needed to take down zombies, and the undead have a troubling habit of getting up when they really, really shouldn’t. The feeling of playing Resident Evil 2 is that of desperate, continuous calculation, considering whether to fight or flee, weighing your ammo and health reserves against what you know about the areas you need to visit. I need to backtrack through this creepy hallway, but I left several zombies alive in it. Do I try to find another route? Do I fight? Or just run for it and hope I don’t get mauled to death? Resident Evil 2 is a zombie-fighting game that refuses to give you enough bullets. The original game emphasized this tension with fixed camera angles, which gave the game a distanced, stiff mood that toyed with player ignorance as a means of sustaining tension. In this game, the camera is an over-the-shoulder, freely movable third-person view, which erases that particular brand of unease. In its place, Resident Evil 2 successfully substitutes moody aesthetics and increasingly dangerous enemies. The zombies here are both aggressive and resilient in ways that are distinct from the original, and corridors are dark, threatening, and unnerving to navigate. 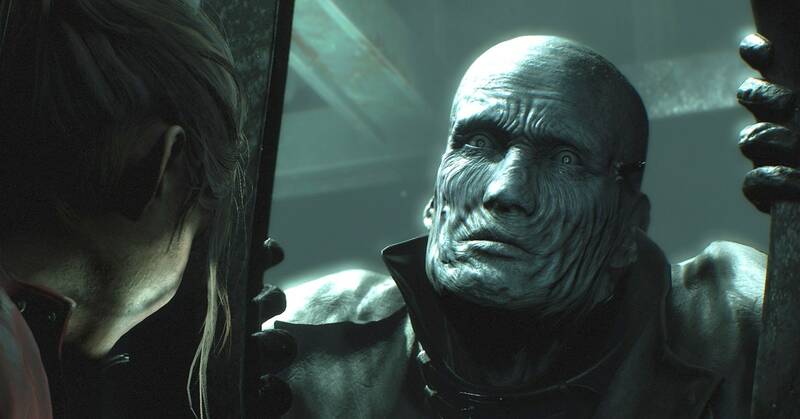 The Raccoon City Police Station is a frightening place, and it has a habit of only getting more dangerous the more time you spend in it—like when the hulking, almost comically imposing Mr. X shows up. The zombie fixer isn’t just super-smart and impossible to kill; he also stalks you, his thundering feet echoing through the walls. But, like many Resident Evil games before it, both versions of Resident Evil 2 make the same mistake: they leave their best setting. Eventually the police station is left behind in favor of sewers, city streets, and subterranean labs, and in the process some of that precious tension is lost. The power of this brand of Resident Evil is in the interplay between anxiety and a slowly expanding environment that you increasingly understand, with threats ramping up to match your growing level of power. When the game moves into other, more derivative environments, its entire structure suffers. And yet Resident Evil 2 shines as a full reimagining of a brilliant game. It doesn’t erase that game’s flaws—in many cases, it reproduces them—but it manages to bring that sense of unease into a game made with the design sensibilities of gaming’s present moment. It’s not necessary, exactly; you could play the old game and still have a terribly threatening time. But so few games evoke this particular brand of unease nowadays. Even if it’s just studying the work of the masters, it’s nice to have another.